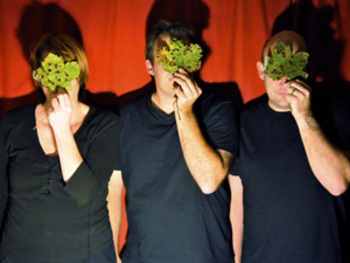 Cambridge-based theatre outfit ‘in situ’ have always operated on the experimental end of the spectrum. Last year’s (and their upcoming) performance of Macbeth in the Leper Chapel was one of the most intense and claustrophobic I’ve ever experienced. A two-person performance using only mutilated and decrepit toy dolls delivered to a 30 person audience at close-quarters will have that effect. Whenever your guide falls asleep, these figures will start to tell their stories. Sometimes these are delivered together at a loud volume, sometimes they form a chorus, and at other times they separate to deliver monologues. This was particularly novel as the audience were given free rein to wander about, pick a figure of their choice (in my case, a bespectacled man in a tree screaming about how Philomela “was absolutely fucked”). Then, when you’ve had your fill, you can head to another figure and try and pick up another story, although this at times proved hard if you’re not completely up-to-date on your Ovid. The form that the stories take constantly shifts, in an effort, no doubt, to mimic the subject matter of the Metamorphoses. We are greeted with animal noises, mime, song, monologue, chorus and metatheatre. This really must have been a gymnastic effort of behalf of the actors involved, and they did a damn good job of it too. There are some minor quibbles however: the guide’s character (Richard Spaul) is perhaps too hesitant and his delivery too eked out to stay engaging at all times. I appreciate that his role is mainly to stall whilst the other actors could get themselves in place for whatever madness is about to ensue, but the character simply isn’t gripping enough and the process of shepherding gets repetitive because of it. Also, not all of the poem-deliveries work perfectly, with some being completely lost during a long-distance shouting match and some unintelligibly hinted at through chalk sketchings. Despite the quality of the poems’ delivery however, what is important is the manifold different forms that ‘in situ’ try. This is what is most important in terms of getting the moral of the Metamorphoses across, as well as being the whole reason that the performance is great fun. Perfectly timed so that the curtain falls (so to speak) as the sun goes down, I left Metamorphoses feeling that I wouldn’t see anything like that again in a long, long time.